With Halloween being just around the corner, eating candy is inevitable this time of year. We wanted to warn you about the worst Halloween candies before you take your kids trick or treating, dig through their Halloween candy or hand it out. 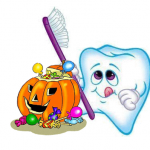 Caramel apples, candy corn, and cookies contain high amounts of sugar, which can cause tooth decay. According to new research published in the journal BMC Public Health, sugars are the only cause of tooth decay in kids and adults. Tootsie Rolls, Double Bubble Gum and Now or Laters can be difficult for children and adults to resist, and even more difficult to remove from teeth. Sour Punch Candy Straws, Sour Patch Kids, and War Heads are highly acidic and can break down tooth enamel quickly. It’s recommended that you wait about 30 mins before brushing your teeth after consuming sour candies because otherwise you’re basically brushing away the acid onto more tooth surfaces and increasing the risk of enamel erosion. While there are no candies that are good for your teeth, chocolate is a better alternative. It dissolves quickly in the mouth and can be eaten easily, which decreases the amount of time sugar stays in contact with teeth. And calcium could help protect tooth enamel. 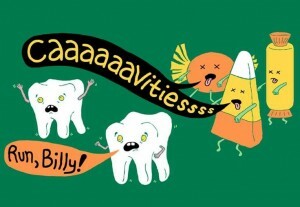 However, chocolate with fillings, such as caramel and nuts, is a lot more harmful for teeth than the plain variety. “Delta Dental News Room.” Recent News Releases. N.p., n.d. Web. 22 Oct. 2015. “Sugar Is the Only Cause of Tooth Decay, Study Says.” Time. Time, n.d. Web. 22 Oct. 2015. “Quick Reference.” Know Your Teeth. N.p., n.d. Web. 22 Oct. 2015.